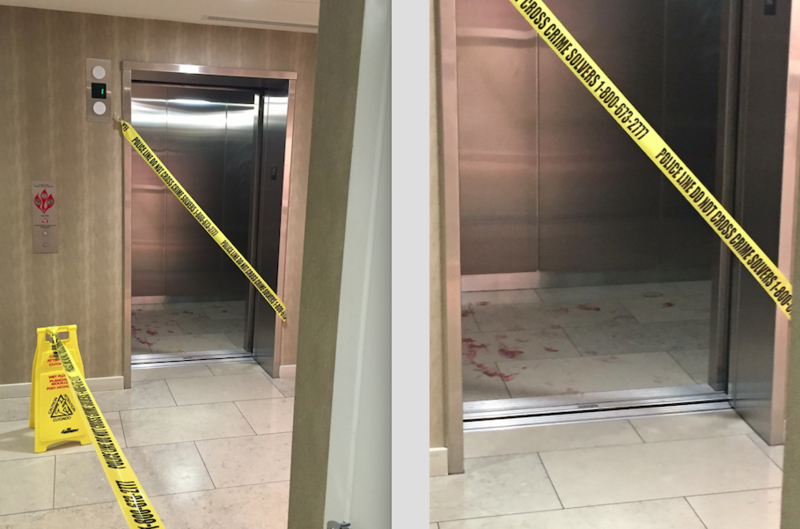 “At about 3:30 this afternoon [Monday], there was some type of altercation on the 6th floor of View 14 Apartments, resulting in blood puddles and spatters up and down the hallway, a cordoned off elevator full of blood with police tape, and police that have been camped outside of an apartment since then. The building sent a vague email that has only caused increased fear and alarm for all residents, but there are rumors swirling amongst residents that a fellow resident was stabbed and there is a potential body in an apartment as the apartment is processed for evidence and a search warrant is executed. “MPD units responded to the location yesterday after being requested by members of DCFEMS. Upon arrival on the scene, an individual was located who had minor lacerations to his legs and feet. The concern from the DCFEMS staff was that the amount of blood in the hallway and residence did not appear to be consistent with the minor injuries on the subject. Unfortunately, the injured individual does not know how he sustained the injuries or how the blood came to be in the building. Our officers and detectives secured the location as a possible crime scene and obtained a search warrant to search the premises for any assault victims and/or evidence. No other individuals were located and we are continuing to investigate. At no time did we receive any calls from tenants in the building regarding any assault or other matter taking place there and in interviews with residents last night, nobody reported seeing or hearing any altercation. At this time, we have not located any victims of an assault and we are continuing to ongoing investigate which is why it is not currently a crime on the 3D crime list today.